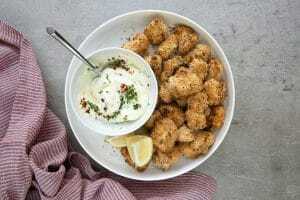 Lighter and healthier, this Skinny Baked Popcorn Chicken Recipe with Creamy Garlic Aioli is baked, not fried, and loved by all ages. Enjoy this popcorn chicken for game day or as a fun and easy weeknight dinner. Prepare the chicken- cut the chicken into small bite-size pieces (approximately the size of large pieces of popped popcorn). Transfer the chicken to a large zip-lock bag. To the same bag add the buttermilk, favorite hot sauce (if desired), and parsley. Seal the ziplock bag shut and mix the chicken with the buttermilk mixture, making sure every piece of chicken is coated with buttermilk. Set aside. Preheat oven to 450 degrees F. Line a large baking sheet with foil and place a wire rack on top. Spray rack lightly with non-stick cooking spray. Set aside. 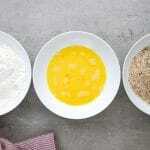 In three individual shallow bowls add the breadcrumbs, the eggs, and the flour, each to its own separate bowl. Season the flour with one teaspoon of salt and one teaspoon of pepper, mix well to combine. To the panko breadcrumbs add one teaspoon salt, one teaspoon pepper, Italian seasoning, and Paprika. Mix well to combine. Season the egg with a pinch of salt and beat until eggs are smooth. Working in batches, remove the chicken from the buttermilk mixture and transfer to the flour. Coat the chicken with the flour mixture and transfer to the egg wash. Coated in the egg wash, transfer the chicken to the seasoned panko breadcrumbs. Transfer chicken to the prepared wire rack, spacing approximately 1/2-inch apart. Repeat with remaining chicken pieces until all chicken has been coated in flour, egg, and panko. Transfer chicken to the oven and bake for approximately 12-14 minutes, or until chicken pieces are golden and fully cooked. Serve with the Creamy Garlic Aioli (below) or your other favorite dipping sauces. Enjoy! 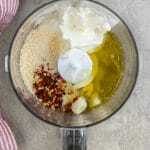 To a small food processor add the mayonnaise, olive oil, parmesan cheese, lemon juice, red pepper flakes, garlic, and a pinch of salt and pepper. Blend on high until mixture is smooth and creamy. Season with additional salt and pepper, to taste and sprinkle with fresh chopped parsley and red pepper flakes if desired. Store any remaining aioli in a sealed container in the refrigerator for up to 5 days. Nutritional information includes the Creamy Garlic Aioli.